Ah, France! The land of bread, cheese, wine, and amazing food. Not to mention a beautiful countryside and a lot of history. I’ve just returned from two weeks exploring the place, and have picked up a few lessons along the way that I thought I’d share. In fact, I picked up so many that this is only part one–part two will be coming next week. The edge of the road is always closer than you think. When the driver’s seat is on the opposite side of the car, it is very easy to forget that there is now a lot more car protruding from the right. Bits of car which should really be kept on the road. The oncoming traffic is generally further than you think. Whether winding mountain passes or narrow country roads with no lane markings, not one car coming in the opposite direction slowed from the speed limit of 80–90km/h. Neither did they hit me, despite my brief bouts of sheer terror. The other drivers knew what they were doing. I simply had to keep going at my own pace and let them do their own thing instead of slamming the brakes every time and shying away. Read the next few steps on the GPS, then trust your instincts when you get there. This is very important when you have a GPS that’s always a few seconds behind, and a big city with lots of small roads and spaghetti junctions. Very important. Else you will find yourself the wrong way down one way roads, heading back the way you came after finally pulling off a jammed motorway (I nearly cried) or going in circles because you keep missing that one road you’re supposed to turn down. The GPS was an invaluable guide. We would have been utterly lost without it. But there are times when we simply needed to observe your environment, read the signs, and trust our instincts (or memories, for the places we circled multiple times) to get us on the right road. Sometimes, the best picnic spots are just a little bit further on. To save money, we had picnics for lunch sometimes–a baguette and ham, cheese, pate, dips… whatever was available. It was cheap and delicious. However, the real problem was finding somewhere to have lunch, especially if we were travelling. One particularly memorable occasion had us stopping on the side of a main road for lunch, after we had passed through one small village after another with no picnicking spots. We pulled over in front of a bus stop, perched on the small wall overlooking people’s houses and gardens, and ate there. Needless to say, we were the recipients of many strange looks and a few amused waves. Not to mention the red faces when a bus pulled up and people got off right beside us! What seems like a little baggage can actually turn out to be a lot. Three girls. 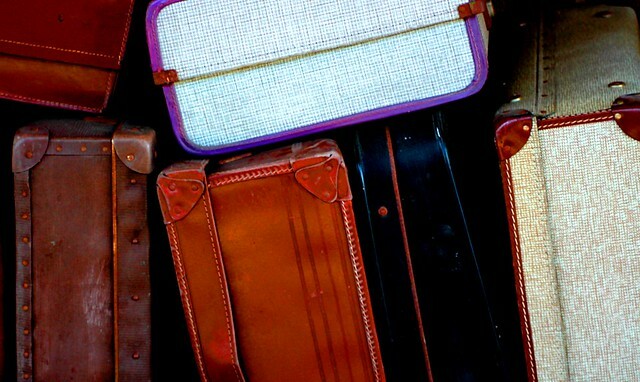 Three suitcases. One large station wagon. No problem, right? Well, no. Baggage takes up much more space than you would think. And it grows exponentially. Repack often, and ruthlessly chuck what you don’t need. Fitting our bags in the back turned out to be a real-life game of Tetris. And we couldn’t even pull the inbuilt cover across the top of the luggage compartment when we were done. That’s not to mention the two spare back seats that were quickly claimed by carry-ons, backpacks, and (most essential of all) a large shopping bag of food. The poor person at the back, who should have had the most space, ended up with the least. It probably says a lot that my fondest moment was tailing the bus down the mountain.